The fourth quarter of 2018 was an awful time for Wall Street and investors, but the first three months of 2019 have been an entirely different story. Investors have been in the mood to buy, pushing up prices. Is it a simple stock market recovery, or the “January effect” on steroids? The January effect, simply put, is a seasonal increase in stock prices during the month of January. The trend of buying in January typically follows a December when investors engage in tax-loss harvesting to offset realized capital gains, prompting a sell-off. Another theory is that investors use year-end bonuses they get from work to buy up stocks in January. So is that what has occurred, albeit over the course of the first three months of the year, rather than just the month of January? According to DataTrek Research, yes. This year’s effect was particularly overblown given the magnitude of the fourth-quarter’s sell-off and investors shouldn’t buy this comeback, according to Nicholas Colas, co-founder of DataTrek Research. Since 1950, January has averaged a gain of about 1 percent in January, according to the Stock Trader’s Almanac. “Our advice for Q2: Forget the last 90 days ever happened. 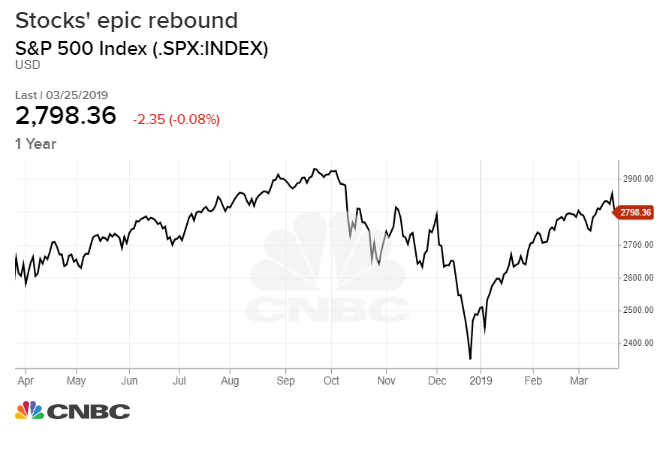 The S&P 500’s 11 percent bounce YTD was basically a January Effect on steroids with a Fed policy change adding gasoline to that fire,” said Colas in a note to clients on Tuesday. The laggards from 2018 have come back much stronger than the market. Case in point: The best performer in the S&P 500 is Coty, which has gained more than 71 percent after bleeding 67 percent last year. Same goes to Xerox, the second best performer in the index, which scored a whopping 58 percent return year to date after losing more than 32 percent in 2018. Sometimes the “January Effect” is used to reference a jump in small cap stocks near the end of a year and into January, a theory popularized by the Stock Trader’s Almanac. The iShares Russell 2000 ETF, a benchmark for small stocks, is up 13 percent this year, more than big caps. Stocks’ epic rebound has had many on Wall Street scratching their heads because it was not fundamentally driven and in fact earnings growth expectations has been cut dramatically in the first quarter and the bond market is flashing a big recession signal. Going forward, the market will have a tougher time sustaining the gains without the helping hand of the January effect, Colas and others said. First-quarter earnings are slated to come out next month. Wall Street is projecting a 3.4 percent earnings loss for the S&P 500 firms, while 73 percent of the companies have already issued negative EPS guidance, according to FactSet.